We all stereotype. But we tend to think of “we” as us stereotyping others. Well, the bad news is that other cultures stereotype you too. 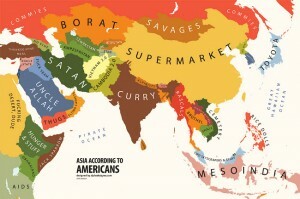 To give you an idea of what these stereotypes look like, check out these maps created by Yanko Tsvetkov, a graphic designer. I predict at first you will laugh at these depictions. You might find them so amusing you will even want to purchase one. Take a moment to think about these maps though. Think how these perceptions affect political, economic, and social issues in your culture and around the world. I don’t think they will be as funny after that. I warned you it was bad news.